This is my second week of participating in Today's Flowers. I'm loving this meme, and I'm especially looking forward to enjoying it during the Winter when I'm needing a flower fix. Luis, this was a great idea for a photography meme, and thank you for allowing me to participate. For this photo, I suggest you give it more than a quick glance, because the more you look, the more you will see. You'll notice things you didn't initially see upon first glance. That's it, I'm done. I'm not going to overload you with way too many photos, like I did on Misty's Words. Now, I could give you a link to a new diet pill, OR I could give you a link so you can go join Today's Flowers. Hmmmm, I'll do both! The diet pill is called Apidexin, and the next sentence tells you have to join this awesome meme. Misty: A very nice show with both the flowers and the critters which help them survive. 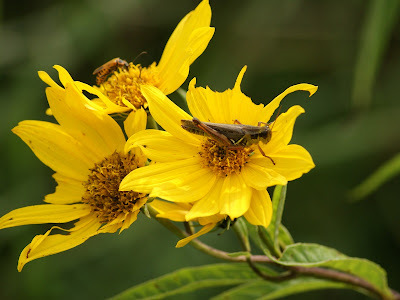 Love the grasshopper in the flower! Many visitors to beautiful flowers. Thanks for share them. Wow, the butterflies love them! I see a wasp and cricket on the first one...Have a nice week! Hi, your sequence of flowers is stunning, with butterflies were more interesting, good job. I thank you for sharing. Wonderful photos, great contribution to Today's Flowers. I have enjoyed looking at your blog, love your dog!!! And all the other photos you have on here. You just gotta get those critters in haven't you? I love your flower photos! Captivating! The flowers and long gone around here but now I know where to come when I need a flower fix. We wont see any until next June it is getting cold now. Wonderful! I see a grashopper and a wasp(?) on the first one and many butterflies on the second one! Those are lovely shots! At first glance I didn't notice the insects. I love how many butterflies are taking advantage of those blooms. I love your flower pictures! They're beautiful, just like my BBFF! Like the critters that accompany your flowers this week! Beautiful pictures thanks for sharing them!